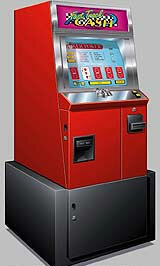 The video poker machine - what to know to make more dough! Here we look a little at the video poker machine itself, because a little knowledge about the box we're putting our money into may go a long way. The machine itself is a pretty straightforward piece of engineering. Modeled after the slot machines that predated them (since slots didn't need to wait for the digital revolution), the video poker machine looks a lot like your standard video game console. It's origins stemming from classic poker, video poker is a rather logical creation, the probable digital counterpart to the classic card game. The mechanics of the machine are simple enough; it's just some circuitry and a monitor. One part of that circuitry represents a random card selector, another part the ranks of poker hands, and another part the rules for the specific version of the game. Combine them all with a determined pay-table and you've got yourself a video poker machine. Some lingo you're likely to hear in video poker circles revolves around 'full pay' machines, or 9/6 games. A full pay video poker machine is one that has a pay table that is the highest standard pay table available for that style of game. More simply, a full pay machine is one in which the payouts have not been altered by the casino to give them a larger than standard take. Looking at a Jacks or Better game your attention should be on the payoff for the full house and flush. For one coin played, full-pay machines return 9 coins on a full house and 6 coins on a flush. This designates the machine as a 9/6 Jacks or Better machine. Lets look at two popular video poker machines, Jacks or Better and Deuces Wild. Jacks or Better is probably the most popular version of Video Poker in existence. Like many video poker games it derives its name from the rules that differentiate it from other games. In Jacks or Better you need to get a pair of jacks or a better hand in order to receive any coins back. If you were to bet five coins and get a pair of Jacks, you get five coins back. Better hands pay out according to the specific machines pay-table. In order to really win, you must get a two pair or higher. A typical payout schedule is shown below. If the machine were a 9/6 (full pay) machine, the full house payout per coin would be 9 and the payout for a flush would be 6. This is what you want to look for in a Jacks or Better machine. The first box you sit down to will most likely not be a full pay video poker machine. There are many examples of 8/5 machines out there, which you should take some time to avoid. A Deuces Wild Video Poker machine treats all 2s (deuces) as wild cards. This means that whenever you get a 2, the card can be used as anything you wish, to complete any hand you want. With Deuces Wild, you have a far better chance of getting good hands, which the casino compensates for by offering a tighter payout schedule. You only get paid with a three of a kind or better. A full pay Deuces wild machine may have a return percentage over 100% when played with perfect strategy. This is the only game in the casino where the expectation goes from the casinos advantage to a player advantage, albeit a small one.